Ahead of the game at Aldershot I reported the armed robbery at the Leeds Permanent Building Society in St. James' Street, and now it looked as though the gunman had struck again. It had later been determined that he got away with £800 and police believed it was the same man who then struck at McDonald's where he threatened a lone female member of staff. This time he got £570. Detective Inspector Ron Griffiths issued a warning to building society staffs to be on the alert and confirmed there had been other similar incidents in the previous three or four weeks. He advised people not to attempt to tackle this man. There was some good news for a group of ladies in the Burnley Wood area of Burnley who had called themselves 'The Crowther Street Mob'. Out of the blue they were presented with the Rotary International Community Service Award. It was well deserved. The 'mob' was the brainchild of resident Mrs Joan Ashworth who had got friends together during the summer of 1986 with the intention of sewing and knitting items to sell to raise money for hospice care in Burnley. And they were successful and had reached the point where they were raising around £550 per month. The award was made during their regular sewing night meeting and Mrs Ashworth said: "It is a pleasure to do the work." Well done to the Crowther Street Mob and also to Gordon Haycock who was making something of a name for himself as a speaker. Gordon was able to speak about his time as a funeral director and his talk at an over-60s club had made the national newspapers. Gordon said: "People are interested in what happens at funerals and what problems we come up against, but it's not something that's usually discussed. They wouldn't dream of coming into the office so they invite me to speak at their meetings, but if I was too serious and dour I'd only depress them. "Like any subject it has its lighter side, so I try to use that to get serious aspects over in a humorous way." Me Haycock would talk about the time when mourners bounced a hearse to free a locked bumper following a pile up and when mourners burst into fits of laughter at a funeral service when the music was played at half speed. So popular had he become that a spokeswoman for a Rossendale over-60s club described him as the best speaker they'd had since a nurse who talked about incontinence. Back in 1991, people still had the habit of leaving their doors unlocked when in the house and I know my mum always fell into this category, always refusing to lock it in case anyone came to visit her and didn't get in. She didn't change either, not even when police appealed to residents to ensure they were locked at all times. There had been a spate of burglaries in the Burnley Wood, Scott Park and Manchester Road areas where people had just walked in whilst the houses were occupied. There was some good news. The pair who I reported had escaped from Haverigg Prison in Cumbria had been recaptured. If you recall the police believed they'd returned to the Burnley area and warned people to be on the lookout for two men with striped shirts and jeans. They were recaptured in Torquay. After Christmas Day there's nothing better than a Boxing Day trip to the Turf and in 1991 it was a special one having just gone top of the league for the first time in over three years. Rotherham United were our visitors. They'd beaten us on the opening day of the season but we'd exacted revenge in the FA Cup. The day proved to be a big disappointment as the Clarets went down 2-1 but let's get this all into perspective. This was the first ever defeat for Burnley under the management of Jimmy Mullen. Going into the game, since he'd taken the job we'd won 10 and drawn 1 league game, drawn 1 and won 2 FA Cup games and won two in the Autoglass Trophy. That's 14 wins and a couple of draws so inevitably there would eventually be a defeat. It probably shouldn't have been on what proved to be a frustrating afternoon in front of a bumper crowd of not far short of 14,000. It was an annoying game that we could so easily have won but time and again we took the wrong options in the final third of the pitch. It was difficult against a tough Rotherham defence, playing in front of Billy Mercer who was again in outstanding form in goal for Rotherham. We could have scored in the first minute and had two more good chances in the first quarter of an hour. That first chance came via a back pass that was short but Mercer got there just ahead of Mike Conroy. He also saved well from John Francis, Roger Eli and a Steve Davis piledriver. It was still 0-0 at half time but we should have been in front, and then, with only 45 seconds of the second half gone, we found ourselves behind when a first time shot from Tony CUNNINGHAM following a thrown in found the net via the post. Mullen brought on fit again Roger Eli and introduced Adrian Randall for his debut and as the game opened up there were opportunities at both ends. Randall, in particular, was showing some great touches. With just over twenty minutes remaining we drew level. Joe Jakub hoisted a 40-yard free kick into the box. It was headed down by Davis and FRANCIS stormed in to slide home from close range. Burnley were favourites to go on and win it but on 78 minutes the game went against us. A ball was played forward that caught Shaun Goodwin and Don Page yards and yards offside. They were so far offside that the linesman probably didn't feel the need to raise his flag. Incredibly they were allowed to go on and PAGE scored past the stranded Chris Pearce for the winning goal and to give Rotherham the double over us. Burnley's biggest crowd of the season had seen the unbeaten run come to an end with Mullen vowing to start another one with the visit of bottom club Doncaster two days later. 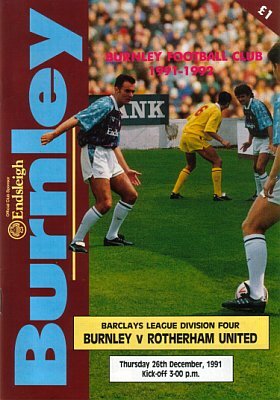 Burnley: Chris Pearce, Ian Measham, Joe Jakub, Steve Davis, John Pender, Andy Farrell (Adrian Randall 62), Steve Harper, John Deary, John Francis, Mike Conroy, Graham Lancashire (Roger Eli 62). Rotherham United: Billy Mercer, Ally Pickering, Chris Hutchings, Mike Todd, Nigel Johnson, Nicky Law, Shaun Goodwin, Dean Barrick, Tony Cunningham, Don Page, Dez Hazel. 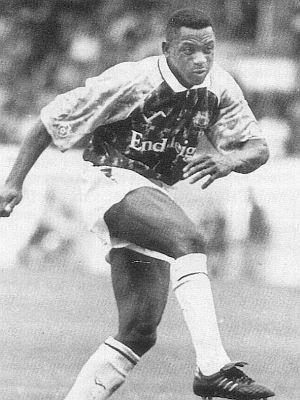 Subs not used: Shaun Goater, Ian Hathaway. Defeat meant we could have dropped as low as fourth in the table with wins for Mansfield Town, Barnet and Blackpool seeing their clubs above us or level with us. Incredibly they all lost meaning there was no damage done. Mansfield's defeat was the biggest surprise. They were beaten 2-1 at home by Scarborough, Barnet suffered a 3-0 defeat at Crewe Alexandra whilst Blackpool went down 4-2 at Walsall. A big thanks to those goalscorers who helped keep us on top. To Scarborough's Simon Thompson and John Asdjian, to Craig Hignett, Robert Edwards and Tony Naylor of Crewe and to Walsall's Rod McDonald and Kevin MacDonald, especially Rod who claimed a hat trick. Those results allowed the gap to close between the top four and the rest but it also meant Burnley were still two points clear at the top with one game to go before we went into 1992.